There is no blending in with this custom Licensed Camo Bottle Insulator. With your artwork or our design team creating artwork for you, your new bottle coolie will be sure to standout but the buck don't stop there. If the custom artwork isn't enough, will also let you have the choice of 4 different camouflage patterns to print your message on. Choose from Mossy Oak Break Up, Mossy Oak Duckblind, Mossy Oak Obsession and Mossy Oak Treestand. 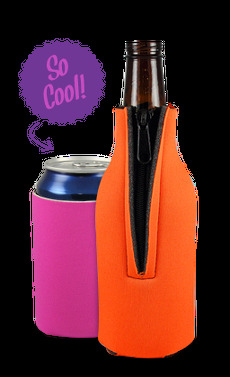 This camo coolie is collapsible and manufactured using premium 1/8" thick scuba material and tailored to fit a 12 oz longneck bottle. With a built in zipper added for convenience, your new camo bottle coolie is sure to be a crowd favorite.